Family, a collaborative art exhibition by King Avenue Children Youth and Families – It's our time to let our creativity shine! King Avenue Children and Youth will be featured in the King Avenue UMC Gallery from March 18 through April 22. All children and youth (and families) are invited to submit drawings, sculpture, photographs, paintings, etc, to be featured in the exhibition. The theme of the exhibition is Family. Use the theme for inspiration... literally, figuratively, responsively, however you feel best. 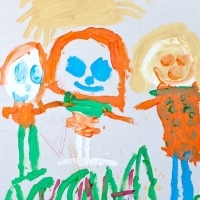 Your piece can be a family project or a solo masterpiece by your child. We will also have an interactive art piece to work on inside the gallery. We will include a group photography collaboration, too. Please also email erin@kingave.org a photo of your family or a representation of your family.